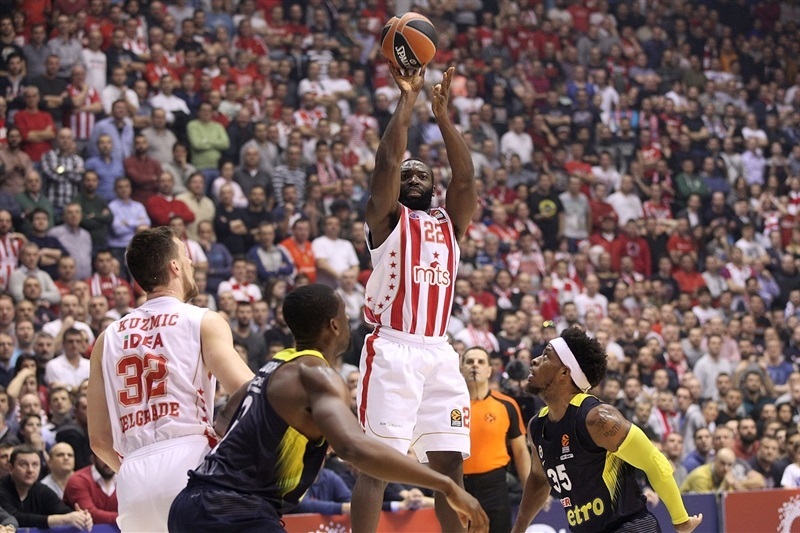 In an exciting, high-intensity match with a nail-biting finish, Crvena Zvezda mts Belgrade pulled out 75-73 win over the visiting Fenerbahce Istanbul in the Serbian capital on Thursday night. 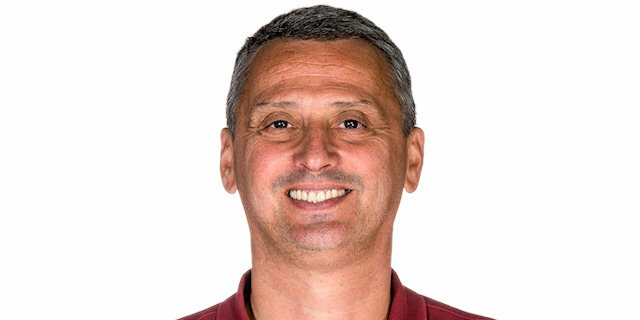 With the score tied at 73-73, Charles Jenkins hit a game-winning long jumper with 12.4 seconds to go, and after a timeout, Ognjen Kuzmic blocked an Ekpe Udoh layup attempt, starting wild celebrations on the floor and in the stands of Aleksandar Nikolic Hall. 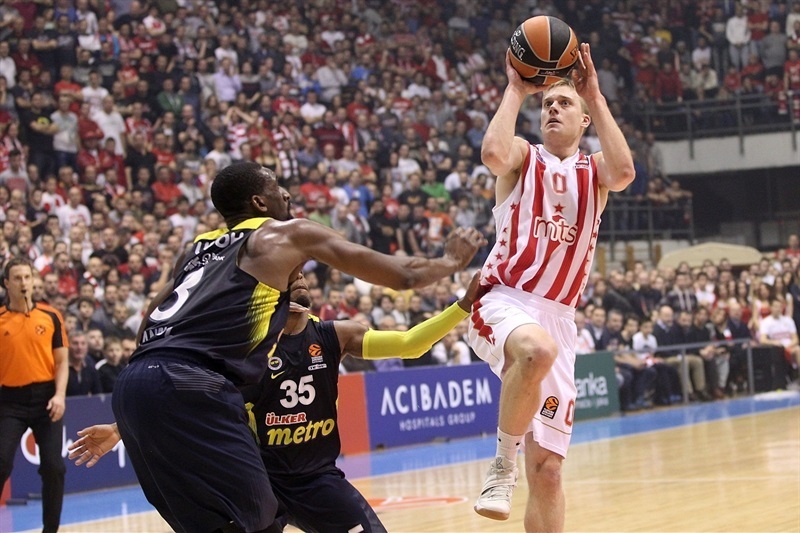 Zvezda improved to 9-8 record with its fourth consecutive win, while Fenerbahce dropped to 10-7. 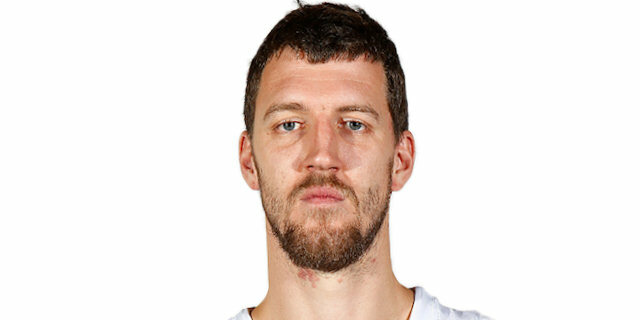 Kuzmic starred with 21 points, 8 rebounds and 2 blocks to lead the hosts. 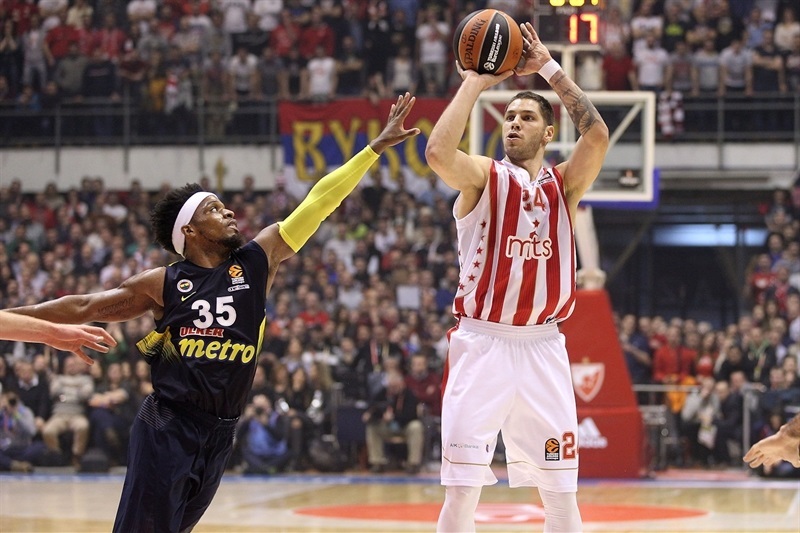 Jenkins finished with 14 points, and Marko Simonovic netted 12 in the winning effort. 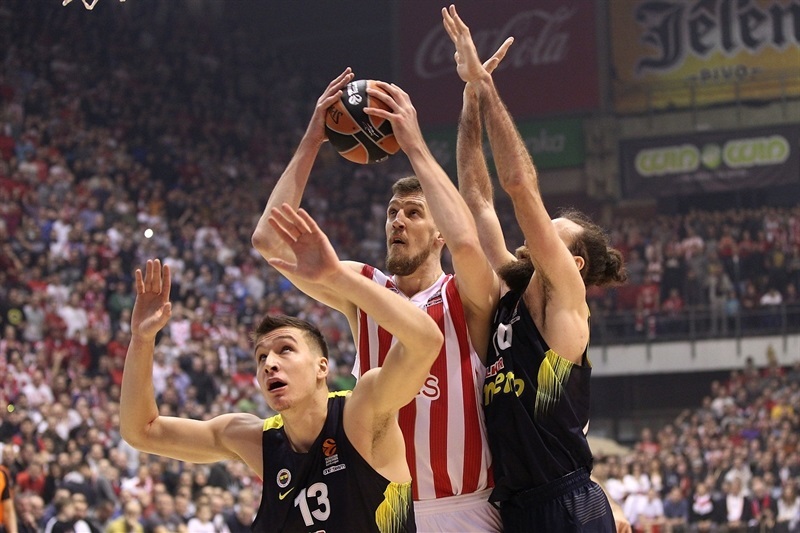 Udoh and Luigi Datome scored 16 apiece for Fenerbahce, and Bogdan Bogdanovic collected 12 points, 6 rebounds and 6 assists in his return to his hometown. Kuzmic was a force inside with 8 points early on, but Datome hit twice from long range on the other end to make it 10-9. 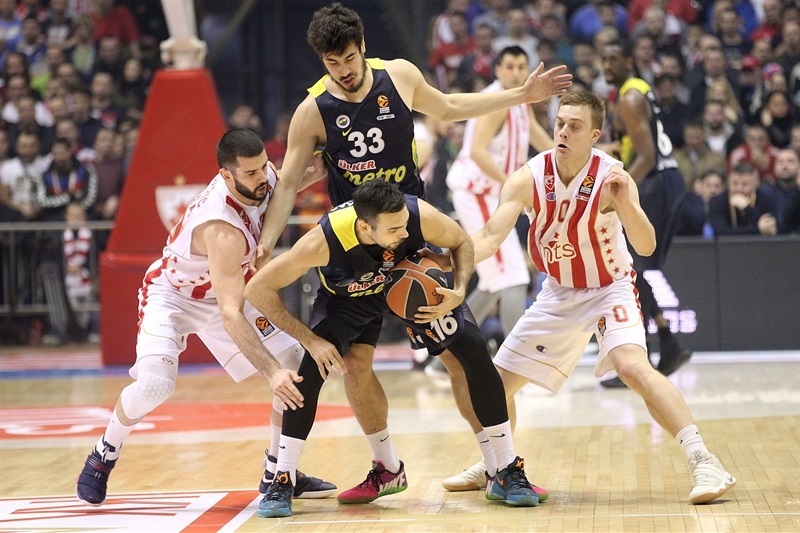 Nemanja Dangubic hit first shot from downtown for the hosts, but Bobby Dixon and Bogdanovic each hit for three-pointer for Fenerbahce, helping it to a 17-21 edge. Jenkins on defense, and Nate Wolters with 4 points before the quarter’s end, helped tied the score at 23-23 after 10 minutes. The teams traded blows throughout the second quarter. 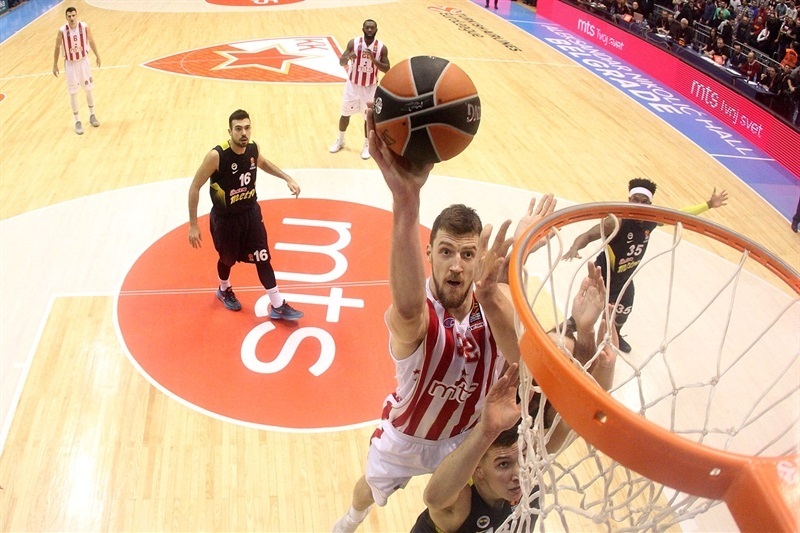 Udoh and Milko Bjelica traded dunks and Branko Lazic scored a three-point play for the hosts, but Datome's third triple helped the visitors lead 33-37. 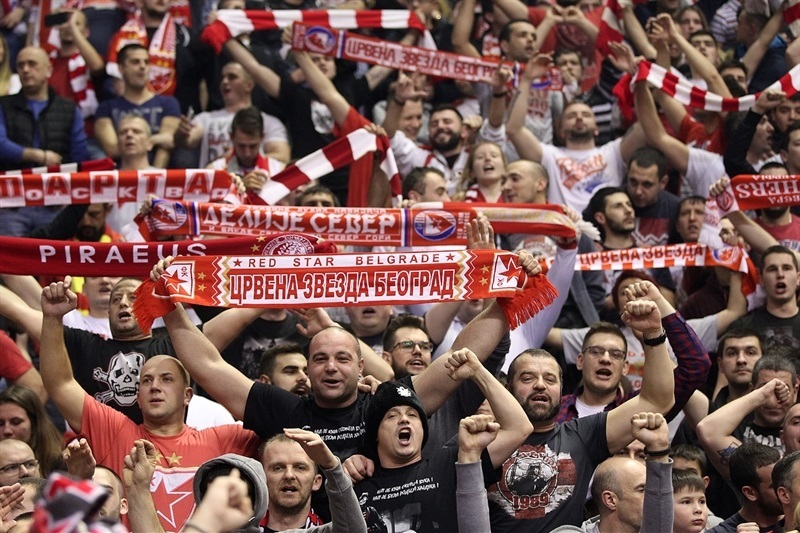 Zvezda quickly nullified the deficit; Nikola Kalinic hit a three on one end and Simonovic on the other, before Deon Thompson, in his first EuroLeague game for Zvezda, made it 44-42 at halftime. After the break, Jenkins hit a three from each corner, and with a jumper from Dangubic and a fastbreak layup from Simonovic, the hosts opened a 54-44 lead. 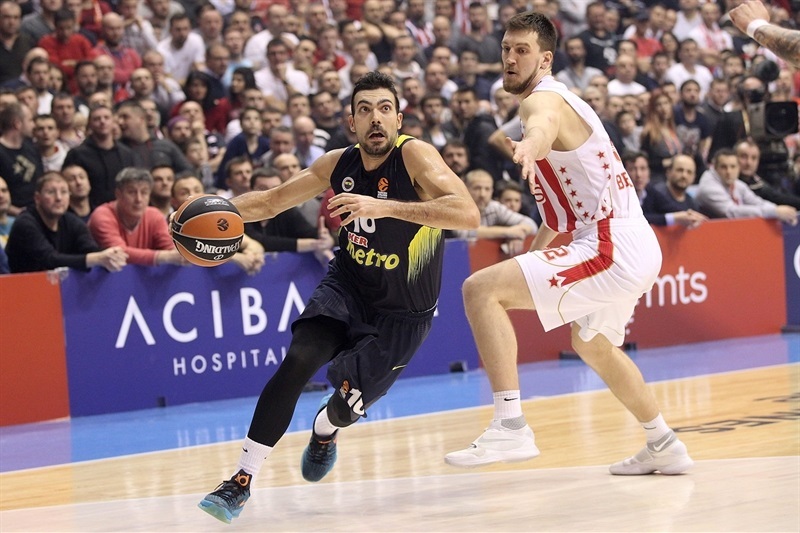 Fenerbahce answered with three-pointers from Datome and Bogdanovic. Kostas Sloukas also scored from downtown in a 0-7 run that tied the score at 59-59. 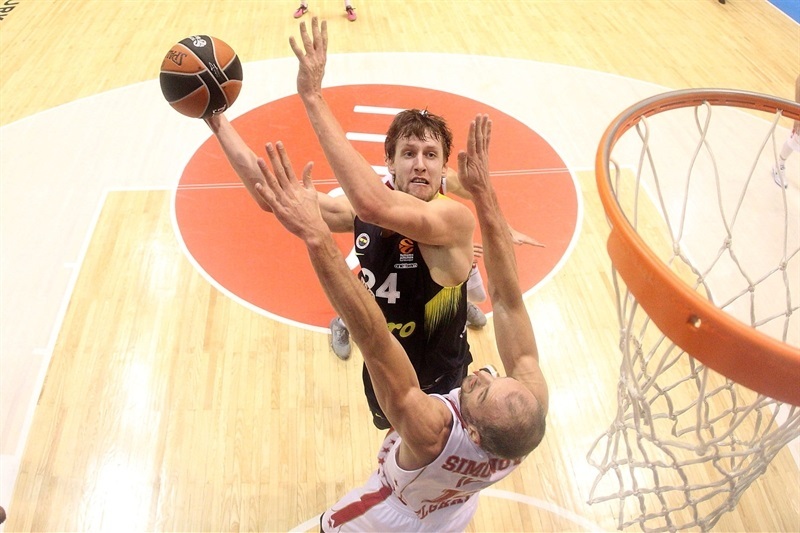 Fenerbahce went up as Vesely came up with a blocked shot on the perimeter and then raced for a dunk and a 63-67 lead. 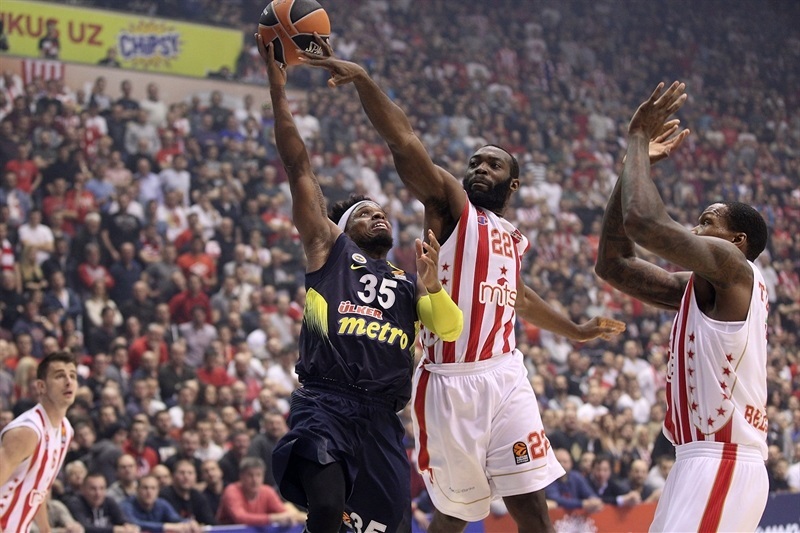 Zvezda scored the next 6 points, but Udoh was coming up big in the paint to restore a 69-73 advantage. However, Fenerbahce did not score in the final 90 seconds. 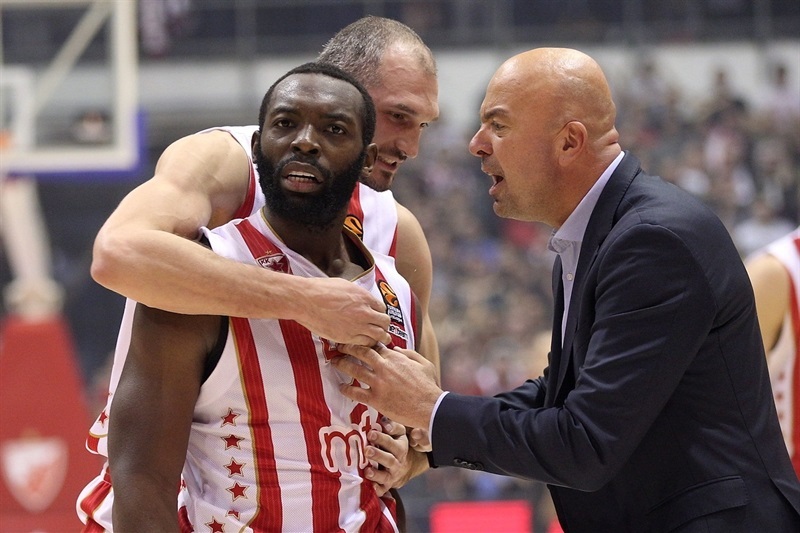 Meanwhile, Jenkins assisted on a Kuzmic dunk-plus-foul, which set up the thrilling ending. "Congrats to the players. It was very demanding all 40 minutes. We have to be pleased that we played smart. Not only at the end, but for the entire 40 minutes. 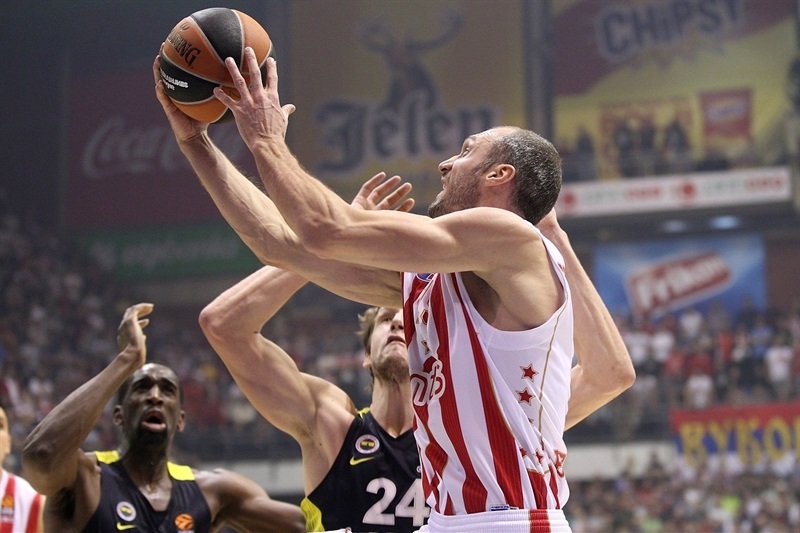 Rebounding was an important segment tonight in order to be successful against Fenerbahce. We managed to control the boards and that gave us a chance to compete against them. The team played well, almost everyone had a big and important role. Our team functions well, and that makes me satisfied. Expectations are rising above what might be realistic. But I think the team is well grounded. However, I think it is natural that fans are feeling positive, and that wins are lifting the mood. " "It was a tough game. In the end it was decided by us making very bad decisions, and Zvezda making smart decisions. We had control, but then made a stupid foul, and had bad defense [on Jenkins’s shot]. We made bad decisions throughout. We knew young Zvezda players have courage to shoot early, but we still allowed them to shoot, defending their shots with arms down. I think we had to win this game. We could have finished the job, we had fouls to give. We did not make fouls when we could, but made a foul to allow them a three-point play when we were up by 4. Zvezda did not surprise us. They play like they play every game. 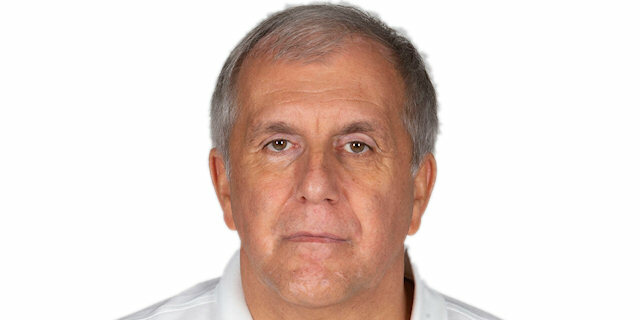 I keep saying there are no favorites in EuroLeage, all results are absolutely possible." "A big win for us. I think we don’t have much time to celebrate. It is nice to win. 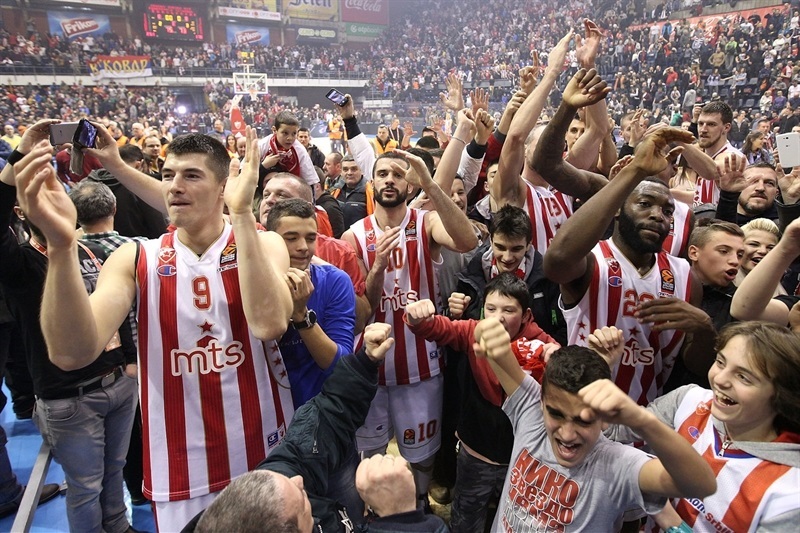 Every game in EuroLeague is a big win for us. I felt good, but it does not matter who scores, just as long as we win."